The Most Popular General Physical Sciences Colleges in the U.S.
General Physical Sciences is part of the Physical Sciences field of study. 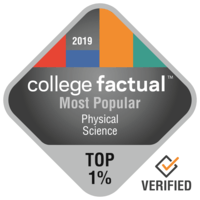 General Physical Sciences is ranked 163rd in popularity out of a total of 384 college majors analyzed by College Factual. It is an uncommon major with only 1,221 graduations per year. 44% of General Physical Sciences students are women while men make up 56% of the student body. General Physical Sciences is studied the most in the Far Western US region of the US. Keep scrolling to explore the most popular colleges and universities for General Physical Sciences majors. Here's how we came up with the ranking. Schools aren't ranked most popular without reason. Check out the college profiles below and see what other areas these schools excel in. CUNY Medgar Evers College is the best choice if you're thinking about a college degree in General Physical Sciences. At CUNY Medgar Evers College, 18.7% of undergraduate students major in Physical Science. Situated in Brooklyn, New York, this school is a very good choice for students who enjoy the thrill of a large city. CUNY Medgar Evers College graduates have only about $14,256 of student loans on average. Which is much lower than the U.S. average of $28,421. Applicants shouldn't let costs prevent them from applying to CUNY Medgar Evers College as 65.0% of undergraduates get some sort of school funding. In what areas is CUNY Medgar Evers College doing the best? Take a look at all the college rankings. Green River College is one of the finest schools in the country for General Physical Sciences. Auburn, Washington is an excellent location for students who enjoy the fast-paced urban lifestyle. This school supports interaction between students and their professors, as evidenced by its 12:1 student-to-faculty ratio. If you're concerned about racking up excessive debt, you will want to keep in mind that graduates leave GRC with about $17,756 in student loans. Get each of the vital specifics on GRC by looking at their scorecard. Seattle Central College is a wonderful option for students pursuing a General Physical Sciences degree. The location in a big city is great for scholars looking for enough prospects for networking, experience, and exploration. Student success after graduation is very important at Seattle Central College, and graduates typically leave the college with total debt much lower than the average. First-year students are not required to live on-campus at Seattle Central College. Take a deeper dive and see just how Seattle Central College ranks in other categories. It is hard to find a better school than Western Nevada College if you wish to pursue General Physical Sciences as a major. At Western Nevada College, 13.0% of undergraduates major in Physical Science. The setting in a significant city is wonderful for scholars trying to find adequate chances for social networking, experience, and discovery. Strong assistance for veterans and military members has earned Western Nevada College a high rating. Western Nevada College does not require freshman students to live on-campus. Videos from Western Nevada College could be a good way to explore college. It's hard to find a better school than CUNY New York City College of Technology if you wish to pursue General Physical Sciences as a major. Brooklyn, New York is an excellent environment for students who enjoy the fast-paced city life. First-year students are not required to live on-campus at CUNY New York City College of Technology. If you're concerned with taking on an excessive amount of student debt, you should be aware that graduates leave CUNY New York City College of Technology with an average of only $17,204 in student loans. Find all the vital specifics on CUNY New York City College of Technology by looking at their scorecard. Bellevue College is a wonderful decision for students pursuing a General Physical Sciences degree. Bellevue, Washington is an excellent environment for individuals who get pleasure from the active city life. This school is well-known for its support of military personnel and is the 504 best in the United States for veterans. You'll get to learn about many different nationalities because of Bellevue College's diverse population. Interested in learning more details on Bellevue College's campus? Take a virtual tour. Every student who is interested in General Physical Sciences needs to check out CUNY Graduate School and University Center. At CUNY Graduate School and University Center, 15.7% of undergraduates major in Physical Science. Positioned in New York, New York, this college is a strong final choice for students who enjoy the buzz of a large city. International students need not be worried about being out of place due to the fact 2.3% of CUNY Graduate School and University Center's students originate from countries outside the U.S.. CUNY Graduate School and University Center has an impressive student-to-faculty ratio of 5:1, so learners should have a lot of opportunities to network with their professors. Look at a few school videos for more information on what is happening on campus. It is hard to find a better school than North Seattle College if you wish to study General Physical Sciences. Located in Seattle, Washington, this college is optimum for individuals who blossom in a city setting. On average, students take on about $16,484 of student loans at North Seattle College. That's lower than the national average of $28,421. This school does not require freshman students to live on-campus. The scorecard provides a fantastic overview of North Seattle College. Any student who is interested in General Physical Sciences has to look into South Seattle College. The location in a significant city is great for scholars trying to find adequate chances for social networking, experience, and exploration. You will be able to meet others from a lot of ethnicities thanks to South Seattle's diverse campus. This school does not require freshman students to live on-campus. A virtual tour may be a good way to learn more about South Seattle College. It's difficult to beat Arizona State University - Tempe if you want to pursue General Physical Sciences as a major. Tempe, Arizona is the perfect location for college students who appreciate the fast-paced city life. Due to the fact the average SAT score of this school's applicants is around 1,150, admissions officers can afford to be pretty selective. The campus at this school is extremely diverse and includes students from over 50 states and territories and at least 50 countries. Watch some school videos to learn more about what's happening on campus.